By 10 km of groomed trails, crossing the North South Station, you can discover all the districts of Port-Barcarès walking, cycling or rollerblading.. Created on the shore of one of three coastal rivers of the Eastern Pyrenees, the greenway Agly connects the Mediterranean close to Barcarès, to the village of Rivesaltes. While waiting to cross the A9, it is 13.4 kilometers without interruption. Seamless, tight security, with excellent smooth coated by 3m wide and 2m of additional stabilized, with magnificent views of the river on one side, the orchards on the other, and opposite the Canigou. 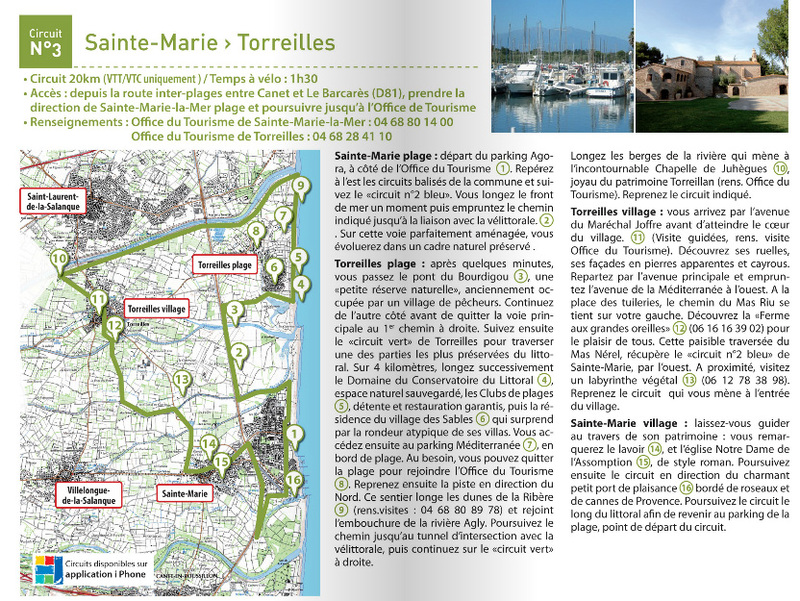 You can visit beautiful villages crossed or very close to (Barcarès, Saint-Laurent-de-la-Salanque, Torreilles, Claira, St. Hippolytus-Rivesaltes) and reach Perpignan by small roads.. Course :The greenway begins at Barcarès at the seaside, at the southern end of the beach, at the confluence with the Agly. Access is possible from the beachfront of the resort, with 0.4 km of cycle track, followed by 100m of rocky transition. From the outset, you admire the wild site of the confluence, and along the river lined with tall reeds, and populated by many birds. In passing under the D81 (Route de Canet), we can go on deck, pass on the sidewalk to cross the Agly, and continue south on back roads parallel to the D81, or on the right bank of the river on a path to Torreilles. The entire route, linear and sunny, is surrounded by nature, in complete calm, with the river on one side, the orchards and vineyards on the other, and the Canigou on the horizon in front. You ride on the dike overlooking the plain and exposed to the north wind, sometimes violent wind in the direction Barcarès-Rivesaltes. You can picnics on the banks of the Agly on almost all the way. In km5, we cross the D11 which gives access to St Laurent-de-la-Salanque (parking and tables in against-low), or Torreilles. KM8 we arrive at the D1 road Claira. The tour continues in the same atmosphere to Rivesaltes or so. Indeed if one passes smoothly from the National Dam 9, the Greenway ends before crossing the A9 motorway. Pending development works promised, you can reach Rivesaltes by a farm road that passes under the motorway. In KM8, bridge D1 (Claira), you can cross the Agly, follow the D1 for 800m, take the small road on the right, then the first left, which leads to Pia. You pass through the village, past the cemetery, and continues straight ahead, then crosses the D1, and reaches the neighborhood of El Vives Perpignan, near the Parc des Expositions, the edge of the Tet. 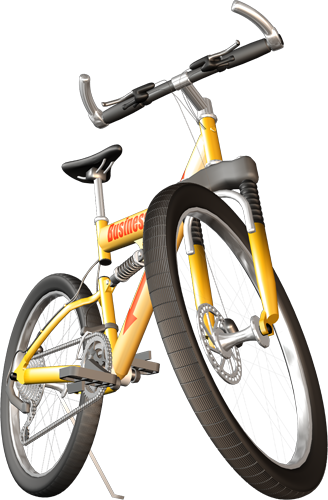 NB: At this Parc des Expositions, there is a nice bike path along the left bank of Tet for 3km, then follows the D31 and D12 crossing Bompas and Villelongue-de-la-Salanque, to Ste-Marie . From there you can return to Barcarès by small roads running parallel to the D81..
Access to the Greenway from Rivesaltes. At last count there are few signs in the village of Rivesaltes to join the Greenway which currently does not start really before 2km. The easiest coming from the center of Rivesaltes is to go north of the town, along the Agly, and cross the bridge (or the fording it's the same), then turn right (towards the east to the sea!) just after the bridge (or after the fording), it is then signposted. 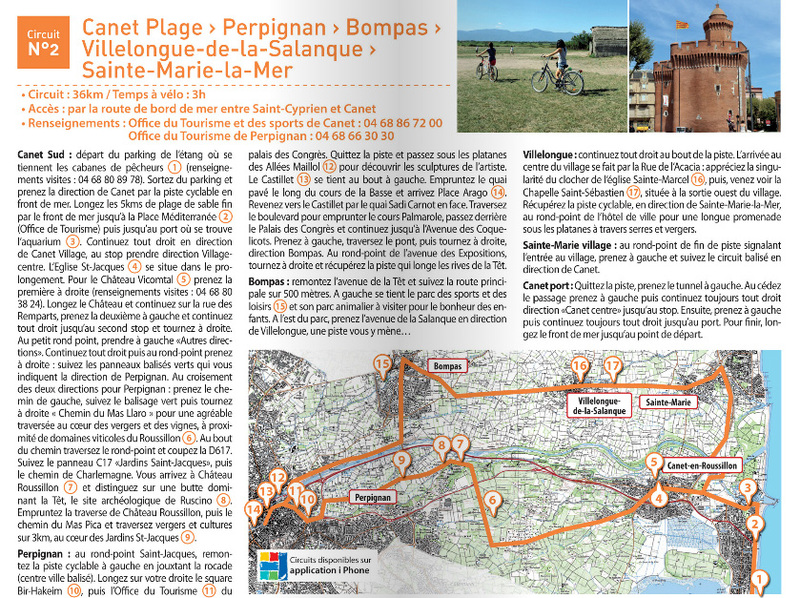 The Greenway starts just after crossing the highway..
"The territory of Perpignan Méditerranée offers a great space of nature, leisure and discovery for cycling. 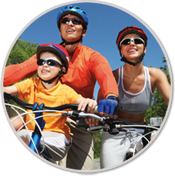 Along the big blue, refreshed by a little sea air, through fields of artichokes or lettuce, escape in the middle of vineyards, peach blossom or fruit: the bicycle crossing our sumptuous Mediterranean landscape offers great moments of joy and discovery for the whole family. 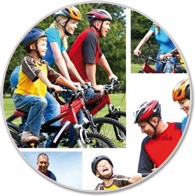 This brief guide includes four bike rides and mountain bike three-VTC, accessible to all, that will give you a good overview of natural resources, heritage and attractions of this territory. Circuits borrow largely cycling routes, which, under the leadership of the Agglo particular, are increasing every year now reaching over 60 km combined. And it's not over! Every walk of this mini-guide also points out many small pellets by the remarkable places that will make your exit. Enjoy the charm of narrow streets and old buildings that mark the passage into the hearts of villages. Extend the bike ride with a visit of curiosity, places of local production or by a swimming enthusiast ... nature activities, here or elsewhere, you will not forget the inimitable charm of contrasting landscapes and colorful the plain of Roussillon between distant mountain peaks and shimmering sea on the horizon." 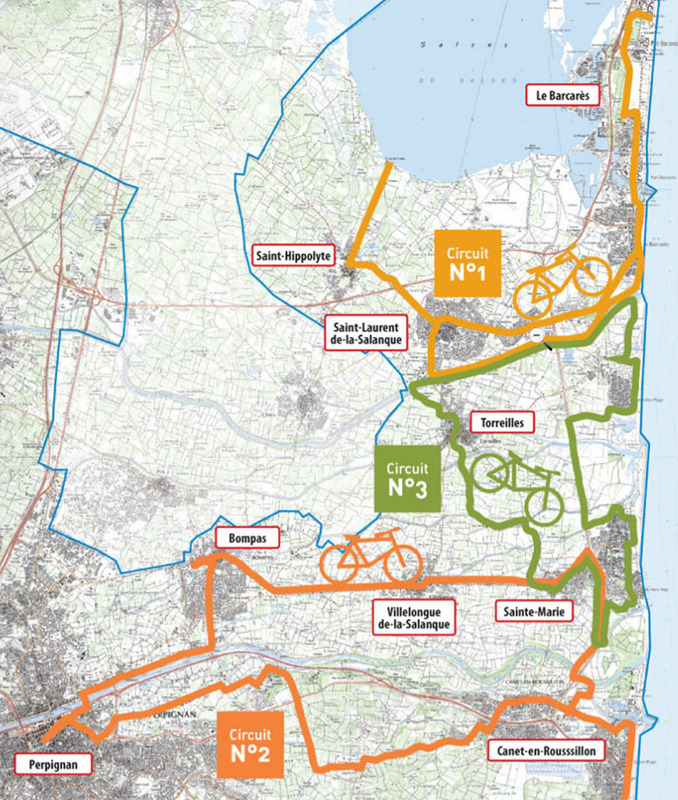 The Vélittorale is a cycle route along the coastline, prepared in consultation with municipalities and communities. The General Council makes connections between stations. End of 2009 the section between Barcarès and Sainte-Marie-la-Mer was practicable along the D81 on parallel rural roads. But we had to climb with ramps on bridges road to cross three rivers: the Aucque the Bourdigou and Agly. 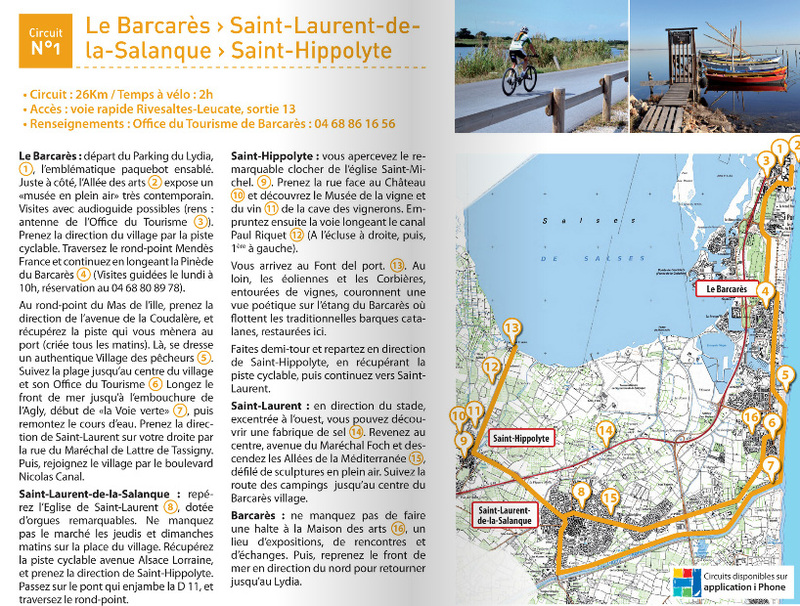 The construction of footbridges bike on Aucque (common Toreilles) and Bourdigou (commune of Sainte-Marie-de-la-Mer) led to the opening of the Vélittorale (Eurovelo 8) 8km continuous between Barcarès and Canet-en-Roussillon. It is a quasi-Greenway used for rural roads are poorly circulated. For continuity avoiding ski bridges the RD lacks a gateway Agly, requested by AF3V.